EXCITING!!! NEW !!! 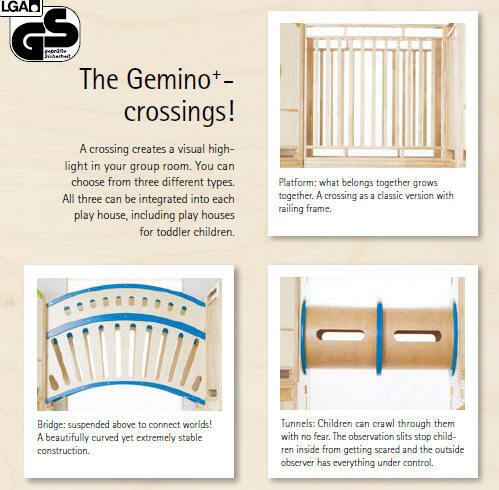 Gemino Play Houses and Lofts including New Enclosed Wooden Lofts, New Climbers with Rock Walls and More, Infant, Toddler, Preschool and School Age Loft Systems, Reading Centers, Floor Play areas and Room Dividers for Indoor Play Areas in Hotels and Resorts, Daycares, Libraries and More. Some models are wheelchair accessible in Lower Levels. Pricing in US and Canadian Dollars - Consumers may purchase these products also. We are really excited to introduce a completely redesigned and new line up of Playhouses and lofts that feature new innovative designs, top quality, function and safety features as well as the added option of customizing each playhouse. We have showcased the Lofts and Playhouses available. For more information including larger images, custom options and footprints please see our Downloadable PDF format Brochure. Gemino Play Lofts PDF. Newer models may not be shown and some models have been discontinued. The modular construction is suitable for any budget and can be adapted when situations change. 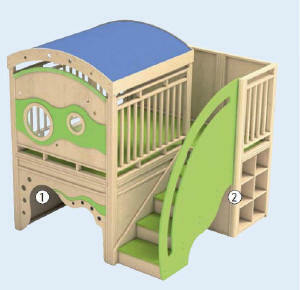 A toddler play house can be expanded for older children. 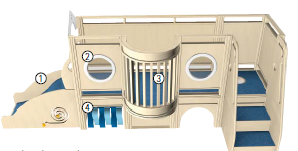 Design options include the addition of Sensory Panels, Up and Down options including stairs, slides, waves, tunnels, bridges and color choices for artificial leather, paint and linoleum. Choose the Unit as is or customize to suit your creative flair. For more information on custom options please see our Downloadable PDF format Brochure. Gemino Play Lofts PDF. Newer models may not be shown and some models have been discontinued. Ships unassembled with complete instructions. Most playhouses can be assembled in 3-4 hours with 2-3 people. Playhouses for ages starting at 1 year and over 3 years of age. Non-slip linoleum surfaces in a choice of three colors if specified. Click here to view color choices and features of the linoleum floor covering. Optional Sensory Panels can be added to the units at an additional cost for the panels. 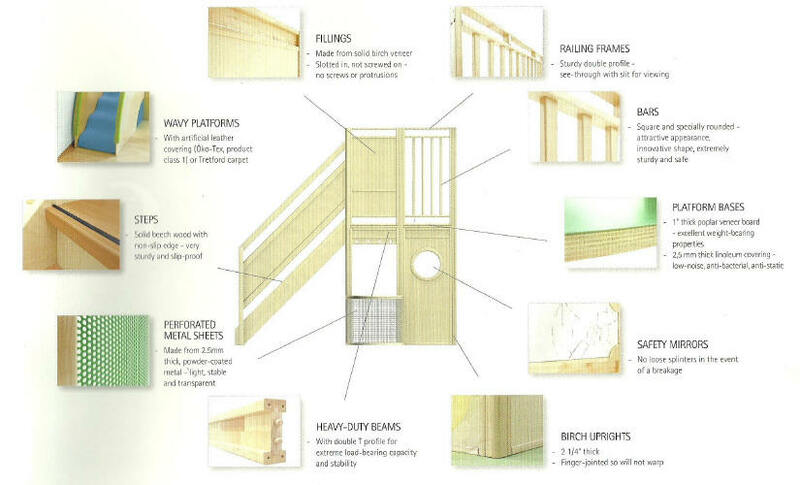 Click here to learn more about the extensive safety features of these lofts and playhouses. Accessories and decorations not included. Click here for Design Options including Up and Down options such as stairs, slides, waves, tunnels, bridges and color choices for artificial leather, paint and linoleum. 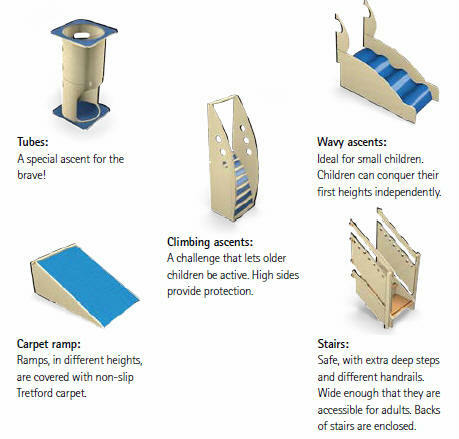 Modular components can be designed to offer floor level and multiple level play areas with easy conversion. 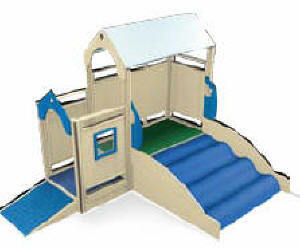 Contact us for Footprints or larger images of Playhouses to help you plan your play area. Create separate areas by adding wall panels - see Play area Products - Room Dividers and Wall Panels. Encourage a quiet reading environment by combining a cozy couch and colourful book storage display or some floor cushions and play mats. 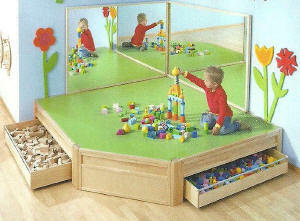 See Play area Products - Book Shelves and Storage and Play area Products - Floor Mats and Floor Cushions. Every day is an adventure with the giant crawling castle. Sightseeing in the group room. Everywhere you look there is something to see. And the wonderful thing is that little ones can discover this world of experiences all by themselves. The path to the top leads over different levels. On the sensory panels there are squeaky ducks, slime and rain sounds to experience. The acrylic glass balcony gives a wonderful view where children can relax and observe. Having recharged their batteries, children continue on down the castle to quickly pick up a souvenir in the shop. Behind the shop there is also a cozy den to investigate and play. If there is still time, the tunnel under the giant castle can be tempting. Optional Sensory Panels shown can be added to the units at an additional cost for the panels. Click here for more information on sensory panels. Order 254000 for upper level mat set. Ages 1 1/2 years and up. Space required: W 167" x H 104 1/2" x D 125 1/2"
See Options to specify artificial leather color. This version is ideal if you need a unit that you can put in the corner. It has been secured all the way around and guarantees entertaining up and down fun over a ramp with Tretford sensory and a small staircase. The top frame is perfect for accessorising with sensory panels. Optional Sensory Panels can be added to the units at an additional cost for the panels. Click here for more information on sensory panels. Ages 1 year and up. Space required: W 81" x H 50 1/2" x D 68"
Space required: W 75" x H 60 1/2" x D 66 1/2"
In this version ofthe play casle the slide goes straight along the wall so it does not protrude into the room. The top frame is perfect for accessorising with sensory panels. Optional Sensory Panels can be added to the units at an additional cost for the panels. Click here for more information on sensory panels. Ages 1 1/2 years and up. Space required: W 115" x H 60 1/2" x D 50 3/4"
A corner version with foam wavy stairs and platforms. The porthole in the base lets light into the den. The top frame is perfect for accessorising with sensory panels. Optional Sensory Panels can be added to the units at an additional cost for the panels. Click here for more information on sensory panels. Ages 1 year and up. 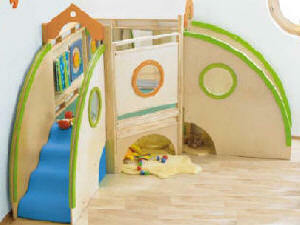 Space required: W 115" x H 52 1/2" x D 74"
This 13 1/2" high play area with linoleum is great for slightly older children. Two drawers create additional storage room. Position in a corner. Ages 3 and up. Space required: W 74" x H 13 1/2" x D 74"
This Balcony unit is designed to be fitted in a corner. The top frame is perfect for accessorizing with sensory panels. Optional Sensory Panels can be added to the units at an additional cost for the panels. Click here for more information on sensory panels. Ages 1 1/2 years and up. Space required: W 94" x H 52 1/2" x D 74"
Play Hotel is one of the most popular resorts ever. Children can go up the little steps and then back down a soft foam wave. The lower level of the unit houses a mini cozy den. The stairs and foam incline provide two ways to the hotel. Ages 1 1/2 years and up. Space required: W 94" x H 57" x D 50"
A fabric roof makes it look even cozier. Special extra feature - the foam wave is twice as wide, but very low, so it is safe for crawling children. Ages 1 year and up. Space required: W 97 1/2" x H 65 1/4" x D 71 1/2"
The Up and Down Linear offers a climb up and slide back down again. This unit also works well free standing in a room. Ages 1 1/2 years and up. Space required: W 91" x H 56 1/4 " x D 26 3/4"
The Up and Down Mini fits into the smallest corner. Just one level to reach the platform - little ones will conquer the wavy staircase with artificial leather coating in no time. Ages 1 1/2 years and up. Corner solution with a den. Here a classic staircase with handrail is used. Children can come back down the slide before resting in the den. Ages 1 1/2 years and up. Space required: W 91" x H 60 1/2" x D 50 3/4"
The Sailor's Corner has three portholes to encourage children's eyes to distant shores and give the unit a harmonious appearance. Explorers crawl over the synthetic leather wave and onto the deck, accompanied by their image in the mirror. A glance over the ship's railings and then back down on the other side, over the gentle, carpeted waves. The cabin under the system can be turned into the perfect quite spot. Platform has Tretford carpet. Optional Sensory Panels can be added to the units at an additional cost for the panels. Click here for more information on sensory panels. Ages 1 year and up. Space required: W 95 1/4" x H 67 1/2" x D 94"
The Gemofant has two options for climbing up the gentle giant and has a slide as his trunk. Slide features two portholes. Choose from the climbing ascent and the stairs. Safety mat required for climbing ascent unit. Optional Sensory Panels can be added to the units at an additional cost for the panels. Click here for more information on sensory panels. Ages 3 years and up. The Roof House Garden is the perfect layout and stands out because of its perfect proportions and corner design. It does not protrude too far into the room because of the front diagonal. This means that the unit also fits perfectly into smaller rooms and keeps walkways free. This Gemino offers a second level, which is very usable but as compact as possible. The stairs are at the side so that the play area at the top is as big as the one underneath. This enables you to make optimum use of the space avialable to you and the corner solutions create a harmonious overall picture. Accessories not included. Grippy handrail can be grasped at two heights. Ages 3 years and up. Space required: W 100" x H 97 1/2" x D 74"
This role play classic has been given a makeover. There is even a shop window added to the design with an unbreakable acrylic pane next to the staircase. Grooved rubber profile acts as a non-slip edge on the steps. Extra wide gap around doors eliminate crushing. If you have more room, the Shop Quarter Section is a deeper model. The counter is located in an attractive quarter segment. Ages 3 years and up. SHOP: Space required: W 76" x H 101 1/2" x D 81 1/2"
SHOP QUARTER SECTION: Space required: W 76" x H 101 1/2" x D 81 1/2"
All Under One Roof is spacious and attractive. The roof elements really give this construction the feel of a little house, but they are also an important safety feature. Overall, a railing height of 44" is achieved here, which even exceeds current GUV requirements. You can let children enjoy the view through the rungs or the colorful acrylic glass without having to worry. At the bottom, the unit excels itself with a translucent, unbreakable acrylic door, a special counter and a perforated sheet element that can be individually accessorized (hanging elements sold separately). Ages 3 years and up. Space required: W 99 1/2" x H 98" x D 79 1/2"
Home Sweet Home features a platform step that even the youngest children can safely climb. At the top, a large area invites them to build or relax away from the group. 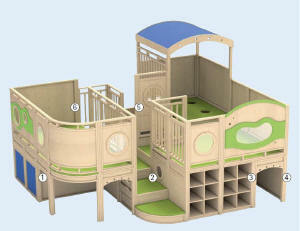 The soft mats (ordered separately)make the 33 1/2" high den under the play house the perfect place to retreat. Platform incline max level height 7". Ages 1 1/2 years and up. Space required: W 98" x H 76" x D 53 1/2"
This house will be enjoyed by many. There is a staircase with extra deep steps on opposite side to the rolling incline with artificial leather. A den under the railed balcony invites children in. The areas of the color wheel slide over one another when the wheel is turned so the colors change. Click here for more information on sensory panels. Ages 1 1/2 years and up. Space required: W 118 1/4" x H 52 1/2" x D 74"
Finding the perfect room design for mixed age groups is a particular challenge. With the multi-generational house, you can create a retreat of their own for younger and older children. The multi-generational house is a playhouse for the whole group. 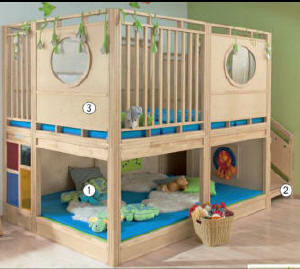 Three year olds can use the large den for playing, building or resting. The staircase at the back leads to the building and play area on the second floor. Crawling age children will feel comfortable in the small den and can get to their play area (behind a very transparent acrylic balcony) via the extra deep staircase in front. In the dens, colorful acrylic panes immerse every view in or out in a special light. Optional Sensory Panels can be added to the units at an additional cost for the panels. Click here for more information on sensory panels. For Bottom Mat set see 254002 in price list. Ages 1 1/2 years and up. Space required: W 145 1/2" x H 72 1/2" x D 74"
The Fishers' Paradise acts as a room divider and space-doubler. Behind the large entrance arch is a large play area on the second floor. Children can stand on the bridge to get a good view of the hurly-burly below. 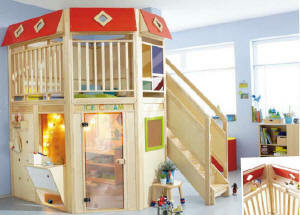 Little ones can bring their fresh haul of ideas to the large play area and resting area or to the den below. With three portholes, a "frog's eye", a staircase with handrail and a little playhouse under the balcony. 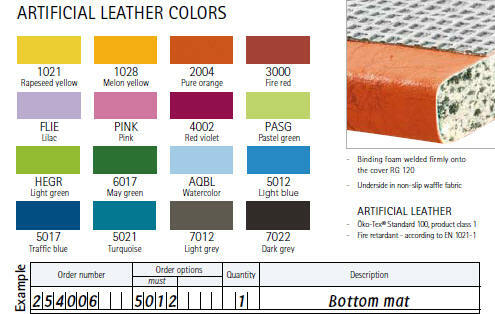 Order 254011 Fall Protection Mat. Ages 1 1/2 years and up. 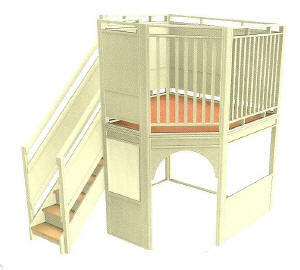 Space required: W 145 3/4" x H 72 1/2" x D 72 1/2"
This playhouse is a truly divine place to play, observe and retreat. There is plenty of space at the bottom for a doll corner or a make-believe house. Two perforated walls can be accessorized individually. The same space is also available at the top for building, reading or resting. Optional Sensory Panels can be added to the units at an additional cost for the panels. Click here for more information on sensory panels. Ages 3 years and up. Space required: W 123 3/4" x H 108" x D 152 1/2"
Adventure Gallery for very interested persons. The first level gives a wonderful view of the other children as they play. Underneath, a quadrant counter with a colorful perforated sheet encourages role play games. The area available for play is almost the same at the top as at the bottom. Shop utensils, craft materials, preschool files and much more can fit in the mobile drawer with 4 x 10 rails. Includes 20 transparent materials boxes. The built-in stopper means that the storage space trolley cannot be pulled out completely and cannot tip. Optional Sensory Panels can be added to the units at an additional cost for the panels. Click here for more information on sensory panels. Ages 3 years and up. Space required: W 124" x H 98" x D 100"
The sensory corner is a real perception experience. Little ones can enjoy the path with all of their senses. They can even watch themselves in the mirror as they climb up the levels. The path around the corner to the ramp has been designed with tactile elements made from cork and Tretford carpet. You can also attach different senses boards to the railings. On the outsider there is an inspiring color wheel whose colors can be pushed over one another so that they change. Optional Sensory Panels can be added to the units at an additional cost for the panels. Click here for more information on sensory panels. Ages 1 1/2 years and up. Space required: W 81 1/4" x H 54" x D 68 1/4"
This house is a wonderful hideaway. There are three entrances for going to the ground and observing - one is next to the stairs, the second is behind the balcony and the third is behind the slide. The top gives a completely new perspective. There are senses boards to discover and the slide to tackle. Optional Sensory Panels can be added to the units at an additional cost for the panels. Click here for more information on sensory panels. Ages 1 1/2 years and up. Space required: W 98" x H 60 3/4" x D 67"
Find an oasis of calm! This construction provides space for 12 sleeping mats and bed covers, especially for establishments with no separate sleeping area. Where moments ago there was play, there is now peace and tranquility. There is a lot of storage space under the raised play area. Children can reach everything themselves. In this way, the play house is transformed into a sleep house. A special optical highlight - the oval portholes. Includes 2 cupboards each for bed covers and sleeping mats. Bed covers and sleeping mats not included. Optional Sensory Panels can be added to the units at an additional cost for the panels. Click here for more information on sensory panels. Ages 1 1/2 years and up. Space required: W 98 1/2" x H 66 1/4" x D 74"
The same structure as the house roof garden but with the staircase on the left. Position in a corner. Ages 3 and up. Platform height is 53 1/4". Optional Sensory Panels can be added to the units at an additional cost for the panels. Click here for more information on sensory panels. Space required: W 99 3/4" x H 97 3/4" x D 74 1/2"
With its broad platform and its landing, it is specifically geared to the little ones who still aren't that good at climbing stairs. They can easily manage the stairs with landings that are 7" high on all fours. When they arrive at the top, a color wheel, large mirror and a gigantic porthole guarantee them a lot of fun. Before they climb down over the soft foam staircase, they can look down into the cave from above through the portholes. Position in a corner. Ages 1 1/2 years and up. Space required: W 122" x H 70 3/4" x D 96"
Free standing platform with padded wave climb and rolling draw. Sensory Panels Ages 1 1/2 years and up. Space Requirements 46"H 116 1/4" x 95 3/4"
Multi leveled Castle with padded wave climb, explorer's cave, children's apartment, shop and toddler's balcony. Sensory panels. Ages 1 1/2 years and up. Must be placed in a corner. Ceiling Height must be over 110 1/4". Space Requirements 101 3/4" H 239 1/2 X 101 3/4"
The Bridge Castle is the perfect kindergarten loft with arched bridge, role play area with acrylic glass door, shop and climbing access (order safety mat separately). For ages 3 years and up and must be positioned along a wall. Space Requirements 108"H x 219" x 82"
The Munich Model loft offers a second level play area with 2 storage trolleys on the lower level (order material boxes separately) and a large mirror. Stairs have non-slip rubber profile and two non-slip handrails. Trolleys ave a built in stopper to prevent the trolley from being completely pulled out or tipping. For ages 3 years and up and must be positioned in a corner. Space Requirements 97 3/4" H x 94 1/4" x 75 3/4 - With Trolleys pulled out 124" wide. Space Requirements 60 3/4"H x 139" x 50"
A big play area for little kids with cushioned wave ascent, an integrated sensory bath with removable lid and a large mirror. Must be placed along a wall. Ages 1 1/2 years and up. Space Requirements 54" H x 98 1/4" x 95 3/4"
Wide platform climb for crawling children. Sensory platform and giant mirror. Porthole in the platform. Ages 1 1/2 years and up. Positioning along a wall. Space Requirements 66"H 98 1/4" x 98 1/4"
Resting spaces for up to 8 children on two levels with optional mattresses (purchased separately). Daybed mattress for top level (3) and 3 piece mattress for lower level (1). Steps with non-slip rubber profile and two non-slip handrails. Position in a corner. For ages 1 1/2 years and up. Space Requirements 90 3/4" H 122 1/4" x 74 1/4"
Small crawling children can make their way quickly up the wave climb or the ramp so that they can crawl through the tunnel or hide in it. From time to time they can look through the portholes or pass the time with the optional sensory panels sold separately. Positioning along a wall. For ages 1 year and up. Space Requirements 54"H 78" x 98 1/4"
New design Gemino Rest lofts feature sleeping areas with optional mats. Gemino B has sleeping space for 6-8 children. Cubby hole cave fits mat item no. 254002 sold separately. Second level has space for 4 day bed mattresses. Portholes in upper space and along stairway. Fabric Roof on upper space creates a cozy environment for resting. Built in day bed and blanket storage. Positioning in a corner. For ages 1 1/2 years and up. Space Requirements 79 3/4"H 122" x 51 1/4"
New design Gemino Rest lofts feature sleeping areas with optional mats. Gemino C has sleeping space for 4-6 children. Cubby hole cave fits mat item no. 254003 sold separately. Portholes in upper space. Fabric Roof on upper space creates a cozy environment for resting. 6 Blanket storage cubbies. Positioning along a wall. For ages 3 years and up. Space Requirements 79 3/4" 74 1/4" x 75"
New design Gemino Rest lofts feature sleeping areas with optional mats. Gemino E has sleeping space for 10-14 children. Cabinets for 12 daybed mattresses. Platform steps. Quilt cabinets for 12 children. Entrance to cubby hole - Cubby hole cave fits 2 sets of mat item no. 254002 sold separately. Portholes in upper space. Fabric Roof on upper space creates a cozy environment for resting. Positioning in a corner. For ages 1 1/2 years and up. Space Requirements 88 3/4"H 147" x 122 1/2"
Gemino Theatre Loft must be positioned in along a wall in a corner- for ages 6 and up. Includes 2 push cart book presenters (matching plastic boxes to be ordered separately), slanted podium climbs with cutouts for 14 seat cushions (included in the price! ), extendable theater stage, padded chill niche, safety glass mirror, trolley wardrobe, upholstered bench to chill, frame cushion to lean on, and magnetic whiteboard (double-sided). Total Height 97 3/4" Space Requirements 216" x 130"
Gemino Space Loft must be positioned in along a wall - for ages 6 and up. Includes 2 push cart book presenters (matching plastic boxes to be ordered separately), platform steps with recesses for 14 seating and corner cushions (included in the price! ), space-saving rolling boxes, upholstered chill corner, safety glass mirror, cloakroom rolling drawer (matching plastic boxes to be ordered separately), upholstered seating corner with rolling drawer, upholstered bench, frame pad, magnetic whiteboard (double-sided). Total Height 97 3/4" Space Requirements 263" x 96"
Gemino Chit Chat Loft must be positioned in along a wall in a corner- for ages 6 and up. Includes upholstered chill corner, whiteboard surface, book presenter rolling drawers (matching plastic boxes to be ordered separately), inclined platform steps with recesses for 14 seating cushions (included in the price! ), frame pad, and magnetic whiteboard (double-sided). 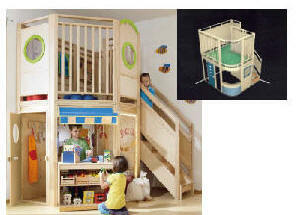 Total Height 97 3/4" Space Requirements 146" x 96"
Gemino Corner Loft must be positioned in a corner- for ages 6 and up. Includes upholstered seating corner with rolling drawer, book presenter rolling drawers (matching plastic boxes to be ordered separately), space-saving rolling drawer, upholstered bench, magnetic whiteboard (double-sided), frame pad, and two corner cushions. Choose from over 30 sensory boards. For safe assembly the sensory boards may only be attached to the loft panels. It is not possible to use the guide rails. When ordering the sensory boards, keep in mind that it may be possible to climb them and that this may entail a risk of falling. In general, you will be able to choose from the entire range. The following should be noted for items on the right and side. It is possible to climb these sensory boards and they may only be built in where there is no risk of falling. This means that they can only be attached to railings that are right next to the wall and not next to railings that point into the room. They must also not be built next to inclines. DESIGN OPTIONS: Loft design options include partition options, inclines, and fillers to customize the look and use of the playhouse. 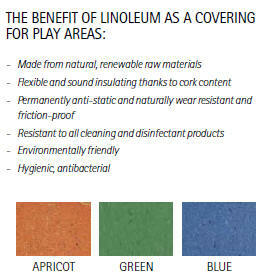 LINOLEUM COLORS: Choose from three linoleum colors as a covering for play areas. Hygienic, antibacterial, permanently anti-static, naturally wear resistant and friction-proof. SAFETY FALL PROTECTION MATS: HIC Certified mats in proven and extremely durable quality available in 6 colors. Underside is rubber-non-slip honeycomb, sealed all the way around. Mat Core is binding Foam RB 160 and Vinyl Mat has grippy, embossed rice grass print, welded firmly onto the mat core and is Flame Retardent. UP AND DOWN OPTIONS: There are lots of options for going up or coming down with the new Gemino system. There are not only steps but a diverse range of platforms. Different platforms, materials and ascents leave no room for boredom. You can design your Gemino individually.